Happy Belated Valentines Day everyone!! I hope you guys all had a wonderful day yesterday filled with love whether that would be with your family, friends, or significant other! For me, I had a simple night in filled with tv, candy, and happiness! Tonight my bf and I are going out to eat to celebrate Valentines! (restaurants were booked last night haha!) I am hoping to be able to do a fun little "Valentines day post" next week! As I am slowly trying to ease blogging back into my life as I go to school, I have been craving to do outfit post again. However, it's really hard to find not only the time and place to shoot pictures especially with living in a dorm! These following picture were from the summer, weeks before I started college! It's crazy how fast the time has past! So as you can clearly tell, it is not winter when these photos were taken! I could actually see the ground haha! (I haven't seen clean ground or grass in weeks!) I cannot wait for it to be just a bit warmer again so I can stop wearing my big poofy coat and break out my dresses and skirts! I think the weather right now has been making me quite tired along with everything that is going on. I am much more involved this semester (volunteering and a job) and while my classes aren't killer, I find myself feeling sleepy and having a short fuse. I'm very fortunate though to have a single!! It does get lonely at times and while I miss my old roommate, coming back to an empty room after a long day is the best feeling! I'm not going to lie though, now that I have the whole room, my room has gotten extremely messy. I guess I gave up trying to be neat for my roommate! 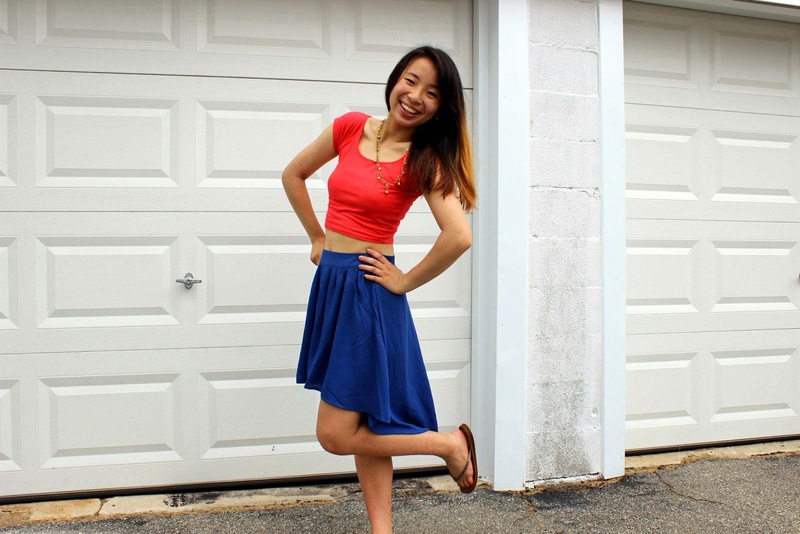 For my throwback outfit post today, I am wearing quite the colorful outfit! I have on a bright orange crop top that I got a while ago. 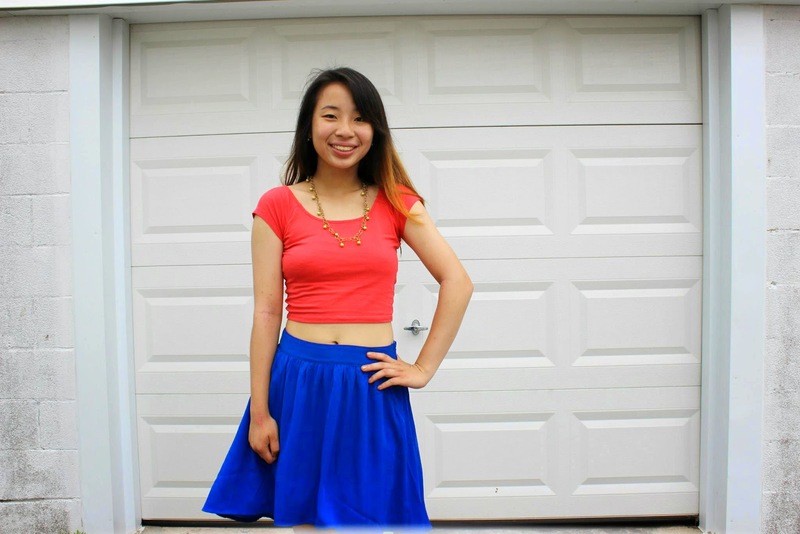 I don't find myself wearing crop tops often, but when I do, I like to pair it with something high waisted. The thought of showing my belly with an outfit isn't what I am used too. I like for my belly button to be covered haha! For my skirt, I have chosen a dark blue high low skirt that I got a while ago. 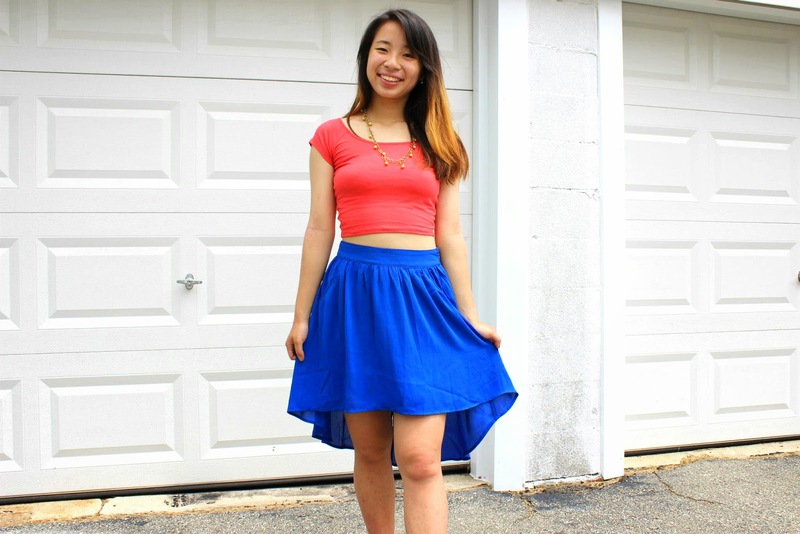 This skirt is one of my favorites since it has something that my other skirts don't have- pockets! Yes pockets are so useful and appreciated to me! These pockets are located in the perfect place for me to put my hands into. For my jewelry, I opted to wear a necklace that I had made a while ago in my jewelry class. 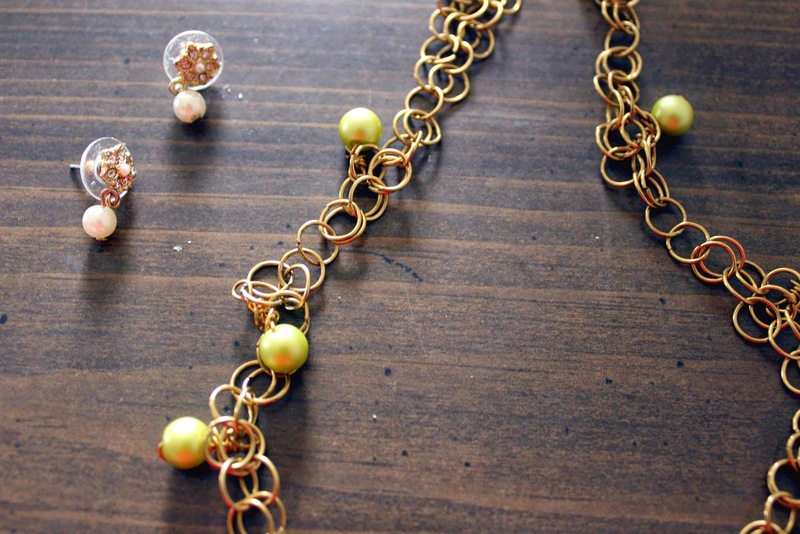 The necklace is made of gold hoops linked together with green beads. For my earrings, I found this cute pair in my closet. The earring is also a gold colored flower with a pearl on the bottom. For my shoes, I have on some tan colored flip flops! 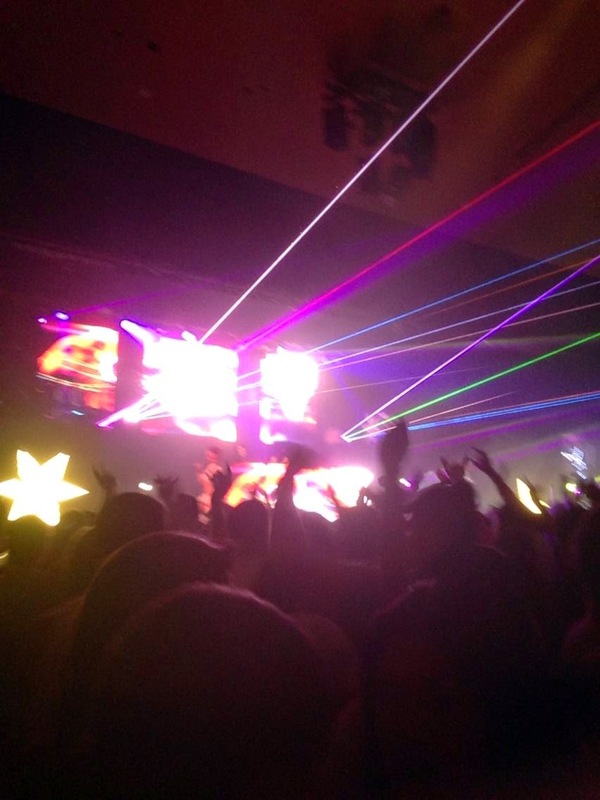 In other news, our school hosted a Winter White concert for us and Cash Cash came!! I had decided not to go, but last minute, I wanted to go! This resulted in an overpriced ticket, but pretty worth it in the end I felt! Are you guys over winter as of now? Are you a fan of Cash Cash? Cute outfit! The colours are great together. I'm sooo done with winter too, can't wait for the warmer weather to come and stay! I hope that the winter weather is starting to warm up for you! It's autumn here in Australia so must be spring for you now? Hello, Mindy! I love the color combo here--it's so bright and trendy. I also really miss summer and completely resonate with your feelings on this semester being more demanding. In the fall, I felt really inadequate because I was only doing orchestra, but now that I'm doing more, I just feel inundated. Fingers crossed for both of us--we'll troop through together! I'll keep you in my thoughts and prayers, girl! Surely time flies fast. I hope your blogging interest is still there. Hahahaha! I didn't really celebrate Valentine as I'm too old for that. But a simple gift of Roses would do for my beloved wife. In my country, we do not have a winter. It's summer all year. We rarely wear thick clothing. Clothes like yours are common. However, the clothes you're wearing suit you well. Till then, have a nice day k? So cute and bold colours. Cute, simple outfit. You look so radiant in this! I have been following it for some time now. I just created my blog and would be very grateful if you could check it out! looking pretty! OMg its been a long time since i last stop by ur blog! Nice style. The clothes suit you well.